IALF runs frequent 1-day Teacher Training workshops which cover a range of useful topics. Workshops are open to the public and are held on Saturdays 9am – 3.45pm, with themes such as Teaching Young Learners or Making Grammar Fun. We also offer customized workshops. If you are on a Study Tour and would like to have a workshop, or you would like us to come to you and deliver workshops for teachers in your area, please contact us to discuss. Teacher Training workshops can be held at any IALF Centre, or anywhere in Indonesia. For further information, contact us. Download the Teacher Training Workshop Dates for 2019 here. Large Classes do not always mean large problems. This workshop is designed to help teachers see the advantages of having a larger number of students and looks at ways to make classes more interactive. Note: More Workshops will be announced. Dates are subject to change. We run various Teacher Training workshops at IALF Bali and can also hold them at your institute or school. We can arrange short workshops at IALF Bali for Study Tour programs or longer workshops (3 to 5 days) for teachers and lecturers across Indonesia. Workshops are taught by Native Speakers and/or Indonesian teachers of English. Topics can be customized based on your teaching needs. Our workshops are interactive and communicative, and teachers are encouraged to share ideas. We can run workshops on other topics by request. 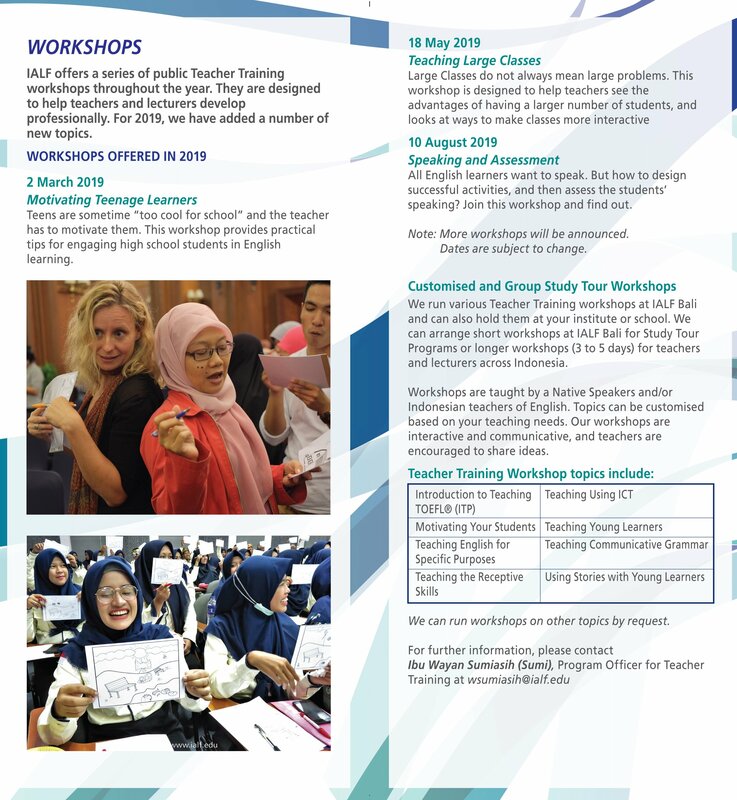 If you have any suggestions for topics, please contact us or email Ibu Wayan Sumiasih, Program Officer for Teacher Training at wsumiasih@ialf.edu for further details.